Whether you find that glib description intriguing or appalling, it's entirely legit. I promise. Katawa Shoujo is a visual novel set in the fictional Yamaku High School for disabled children, located in modern Japan. Hisao Nakai, a normal boy living a normal life, has his life turned upside down when a congenital heart defect forces him to move to a new school after a long hospitalization. Despite his difficulties, Hisao is able to find friends - and perhaps love, if he plays his cards right. There are five main paths corresponding to the 5 main female characters, each path following the storyline pertaining to that character. The story is told through the perspective of the main character, using a first person narrative. The game uses a traditional text and sprite-based visual novel model with an ADV text box. The aforementioned five female characters include a blind girl, a deaf girl, a track and field athlete who lost both her legs in a traffic accident, a burn victim and a "thalidomide girl" whose birth defect manifests in the form of severely shortened arms. Despite their respective physical limitations, each girl features the typical adorably big-eyed anime heroine look. And as the protagonist of the story, it's your job to romance these ladies. Before any of you can react, let me also mention that the game has had a very, very long gestation period. If it weren't for the subject matter, that would be the interesting story here. The story of Katawa Shoujo is a long one, spanning over a decade. In December of the year 2000, the doujin Schuppen Harnische was released by the artist RAITA of circle Zettai Shoujo. One of the pages in the extras section of the doujin contained a sketch imagining a game about disabilities set in a Japanese high school. If not for later events, that may well have been the end of it. With the sticky in 4chan's anime board in January of 2007, though, interest was suddenly sparked in the idea within, and the idea of creating this game came about. After months of brainstorming, but little progress, a core development team by the name of Four Leaf Studios was formed in April of the same year. With this, Katawa Shoujo was set on the path to its final creation. Four Leaf Studios is a volunteer group of twenty-one developers from around the world, having come together for the sole purpose of developing Katawa Shoujo. Hailing from many different countries, backgrounds, and professions, Four Leaf Studios became committed to working towards Katawa Shoujo as an entirely free game, with no money involved in the project. But in this reality, that tale takes a back seat to the eyebrow-raising existence of a videogame that tasks players with dating the physically disabled. Feel free to scrawl any kneejerk opinions in the comments section below, but since I'm writing this story, I get to go first. While initially the idea of this game seemed purely exploitative and crass, the more I think about it, the more I realize that this is a positive. For a surprisingly large segment of the gamer population, these sorts of visual novels are an expression of their sexuality, so doesn't it stand to reason that the subgenre should include all facets of the multihued tapestry that comprises human romantic thought? 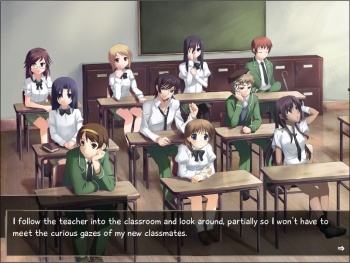 If anything, Katawa Shoujo offers a counterbalance to the vast assortment of visual novels that focus on large-breasted, blonde cliches, and with that it pushes the needle a bit closer to representational equality. If nothing else, it should inspire discussion about the very real trials and tribulations the physically disabled face when it comes to romantic interaction. Well, that's the ideal anyway. After you're finished waxing vitriolic in the comments, you can actually download the game, free of charge, for either PC or Mac via Four Leaf Studios' official website. At the moment it seems to have been crushed by a flood of traffic, but I've been told that it should be coming back up just as soon as the studio's tech staff can snuff the server fires.